The 35 million year old bud has a long and colorful history. It is a beautiful bud considered a symbol of love. They are widely known as ornamental flowers. Their enticing fragrance is also used in perfumes. The beautifully arranged Right and White Roses can melt anyone’s heart. 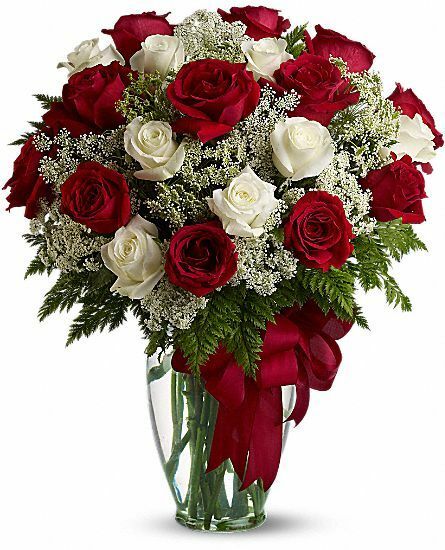 The 8 white and 8 red roses are carnated with beautiful seasonal fillers for the love birds. The roses were very good. Great Delivery as well. Loved the roses. They were fantastic. The site of yours was recommended by my friend, & I chose to order this combination of Roses, as they looked quite beautiful. The experience was awesome! Flabbery made our anniversary as memorable, thanks team. It delivered by two people (including one lady) with a wish which is indeed. Thanks once again, i would prefer Flaberry in future..
*Vase> Not as shown and was not looking as good as the one in the pic. Overall> Little overpriced but okay after some discount. This really helped me to make my fiance cheer again. So thumbs up from my side for this one. But I find 16 roses were not just sufficient to make the bouquet feel complete. So go with the 20 roses version and the fillers between the roses are not white but green leaves. So this might decrease the eye catching presentation of this bouquet. But fresh flowers and beautiful vase compensates for all these problems. Thanks for helping me to cheer my fiance. Flowers are overpriced but service is good. Recipient liked the flowers. The delivery boy called to confirm tha address. I didnt get to see how the flowers look but the recipient loved them. I want to make a special mention of the flower delivery boy who called me to confirm the address and delivered it in the morning. I feel the flowers are overpriced but i liked the service.